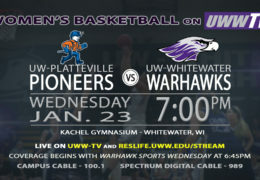 Warhawk Men’s Basketball to Host UW-Platteville Pioneers, Tomorrow LIVE on UWW-TV! UWW-TV Brings You UW-Whitewater Women’s Basketball v. UW-Stout Blue Devils LIVE Tomorrow Afternoon! 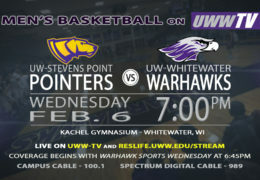 Men’s Basketball to Host UW-Stevens Point, Tomorrow LIVE on UWW-TV! UW-Whitewater Women’s Basketball to host UW-Oshkosh in Postponement Game! 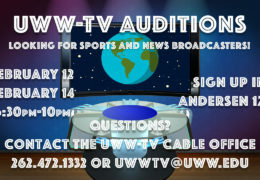 UWW-TV Wants You to Pursue Your Passion for Being an On-Air Talent! UW-Whitewater Lady Warhawks to Host UW-Eau Claire Blugolds, Tomorrow, LIVE on UWW-TV! 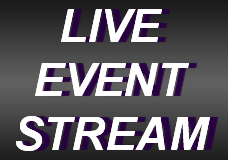 Tomorrow! UW-Whitewater Men’s Basketball to Host UW-Lacrosse! 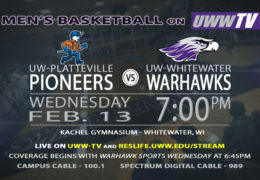 The UW-Platteville Pioneers Enter Warhawk Territory Tonight, LIVE on UWW-TV!